First and most importantly, you need to do your research. Yes, this starts with figuring out what similar job titles compensate, but that’s just surface level. You should learn specific standards for your industry, skillsets, years of experience and location. Get started by talking with your network. Although connections might not be comfortable with sharing what they specifically make, they can give you a clue into what you can expect. Furthermore, check out other online resources for additional insight. Although a larger number on your paycheck would be nice, there are many other things to consider. For example, is the company giving you flexible work hours or potential to work from home? Other examples include, expensing allowances for travel or commuting, paid gym memberships and other wellness programs, 401K matching and vacation/personal time. Think beyond the paycheck and see if you can negotiate things like that to make your new position more rewarding all-around. Always, always, always mind your manners when negotiating, because you certainly attract more bees with honey than with vinegar. The employer is always more willing to negotiate with a person more if he/she feels you’re enthusiastic and grateful. On the flipside, remember that even if you feel the offer was unfair, you cannot be rude about it or the employer will quit negotiating and the offer might be rescinded. 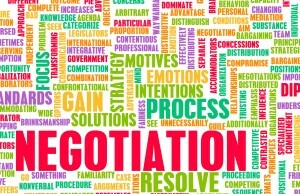 Negotiating compensation is a nerve-wracking step in the job search, but if done correctly, you will be glad you put in the effort! This entry was posted in Job Seekers and tagged job offer, negotiating salary, negotiation tips, salary negotiations. Bookmark the permalink.